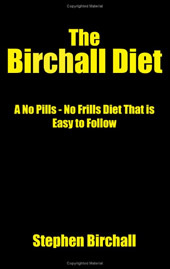 The Birchall Diet: A No Pills – No Frills Diet That is Easy to Follow< was created by Stephen Birchall. He says that “Any diet that tells you exactly what to eat and when cannot possibly work for everyone” and offers a commonsense plan to help dieters to easily lose weight. Stephen Birchall says the only dietary advice you need to follow is that of your own body. By learning to listen to your body you will naturally monitor your intake of calories. If you have an active day your body will give you different messages than when you have a lazy day so naturally your body becomes the “diet expert”. Although the Birchall Diet has no guarantees, Birchall mentions weight losses of two to four pounds in the first week. He says that he lost twenty-four pounds in eight weeks without trying. Birchall believes that the basics of any diet should be around simply allowing you to eat less without it being torture. His diet allows you to eat anything you like, just in smaller portions so that you can still lose weight. Whenever you eat it should be exactly what you feel like eating. Diet and low calorie foods are discouraged because Birchall says that enjoyment of your food is an absolute necessity, otherwise the diet will not work. This strategy enables you to tune into your true appetite and make use of your body’s ability to control its own weight. Eating smaller portions will also teach your stomach to expect smaller volumes of food, which makes it easy for you to maintain your weight loss once you have achieved your target weight. No specific foods are recommended in the Birchall Diet although a high intake of fruit and vegetables is encouraged. Exercise is not a part of the diet and Birchall believes that it is not necessary for you to lose weight. He does mention the importance of exercise for health reasons, but says that if you don’t want to exercise it won’t affect your results on this program. The Birchall Diet: A No Pills – No Frills Diet That is Easy to Follow retails at $13.49. Good for dieters who don’t like exercise. Helps dieters learn about portion control. Some dieters will require more specific guidance. Recommends that dieters listen to the experts on what foods to eat, which may be confusing. The Birchall diet is a simple and commonsense approach to dieting that allows you to continue eating your usual diet and still lose weight. It teaches dieters about portion control and encourages learning to listen to the messages from the body regarding appetite. The recommendations are sensible and most dieters will lose weight by reducing portion sizes. However a large proportion of dieters will require a more specific approach in regards to the composition and structure of the diet if weight loss is to be successful over the long term. After several years of trying various diets it was tremendous to finally find The Birchall diet which proved really easy to follow and produced great results. It is simply common sense but set out in a way which encourages you to manage your eating without any difficulties. By following the sensible programme, you can continue to eat all of your usual foods but in moderation. The results come very quickly so encourage you. I found that my weight reduced steadily without any hardship. I would recommend this diet to anyone.